A suspended BLUE DANUBE © Crown Copyright. The first Blue Danube was delivered to RAF Wittering in November 1953 although there were no aircraft equipped to carry it until the following year. No. 1321 Flight RAF was established at RAF Wittering in April 1954 as a Vickers Valiant unit to introduce the BLUE DANUBE nuclear weapon into RAF service. Declassified archives show that 58 were produced [editor: Other internet sources suggest that only 20 were produced, but could this be that only 20 were deemed to be servicable at any one time] before production shifted in 1958 to the smaller and more capable RED BEARD weapon, which could accept the BLUE DANUBE core and be carried by smaller aircraft than the V-bomber fleet. BLUE DANUBE was retired from service in 1962. BLUE DANUBE was the first operational British nuclear weapon. The RAF V-bomber force was meant to use BLUE DANUBE at a time when the first hydrogen bomb had not yet been detonated, and the British military planners still believed that an atomic war could be fought and won using atomic bombs of a similar yield to the Hiroshima bomb dropped by the US to end the Second World War. For that reason the stockpile originally planned was for up to 800 bombs with yields of approximately 10-12 kilotons. V-bomber bomb bays were sized to carry BLUE DANUBE, the smallest-size nuclear bomb that was possible to be designed given the technology of the day (1947) when their plans were formulated. 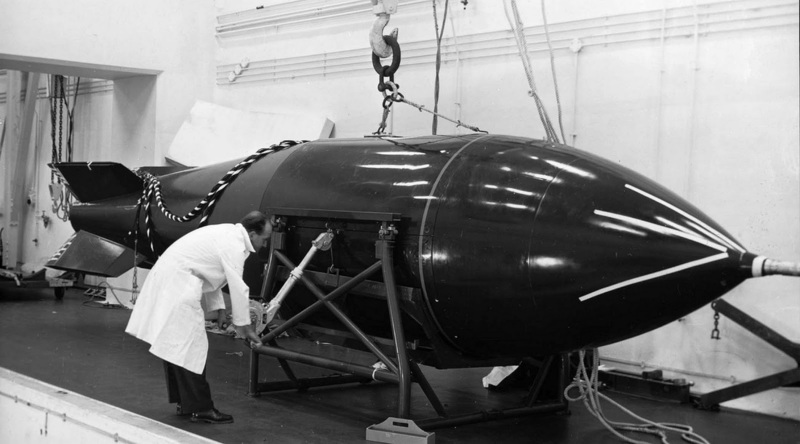 Initial designs for the BLUE DANUBE warhead were based on research derived from Hurricane, the first British fission device (which was not designed nor employed as a weapon), tested in 1952. 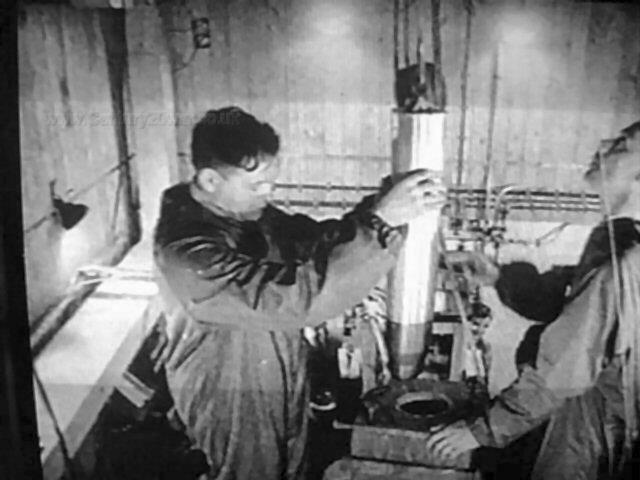 The actual BLUE DANUBE warhead was proof-tested at the Marcoo (surface) and Kite (air-drop) nuclear trials sites in Maralinga, Australia, by a team of Australian, British and Canadian scientists in late 1956. Blue Danube added a ballistically shaped casing to the existing Hurricane physics package, with four flip-fins to ensure a stable ballistic trajectory from the planned release height of 50,000 ft. The flip fins were needed to allow it to fit in the carrying aircraft's bomb bay. It initially used a plutonium core, but all service versions were modified to use a composite plutonium/ U-235 core. A version was also tested with a uranium-only core. The service chiefs insisted on a yield of between 10-12 kT for 2 reasons. Firstly to minimise usage of scarce and expensive fissile material; and secondly to minimise the risk of predetonation, a phenomenon then little understood and the primary reason for using a composite core of concentric shells of plutonium and U-235. experiment on a gigantic scale, which needed to be re-engineered to meet service requirements. That re-engineered weapon became Red Beard. A similar account could be written of the first U.S. atomic bomb, Fat Man, which was quickly re-engineered after World War II. © Crown Copyright. Model of BLUE DANBUBE with the fins extended and the nuclear physics package visible in the central sphere. This is similar to the physics package used within BLUE DANUBE. © Crown Copyright, a picture of the fissile core on its 'gauntlet'. The gauntlet was the device on which the fissile core was mounted before inserting it into the physics package, thus positioning the core precisely at the centre of the implosion sphere.